Not only is this Red White and Blue Berry Yoghurt simple, delicious and healthy, but it’s also a beauty to look at with its mix of colours! Make any breakfast festive or start your 4th of July weekend with this easy yet delicious and healthy breakfast ready in a jiff. One of my favourite things in summer, besides the sunny days and balmy nights, is the abundance of fresh and colourful fruit one can find at the farmers’ market. Every Saturday morning it is a joy and has become one of my favourite ways to grocery shop to peruse the stands at the market and like a butterfly flying from flower to flower browse along the lines and sellers. My only problem is that I am a real food-glutton as I want more and more: this Saturday I bought raspberries, strawberries, blueberries, cherries, sour cherries, red- and black currant and some rhubarb. With so many lovely choices I had a hard time limiting what to sample first, so I opted for this Red White and Blue Berry Yoghurt. It’s perfect for a weekend breakfast to savour at your leisure or due to its simplicity and how quickly you can throw it together great for any rushed yet healthy weekday breakfast or snack. Not only is this Red, White and Blue Berry Yoghurt simple, delicious and healthy, but it's also a beauty to look at with its mix of colours! Make any breakfast festive or start your 4th of July weekend with this easy yet delicious healthy breakfast ready in a jiff. Wash and place the red berries in a separate bowl from the blue/black berries. Mix together the Greek yoghurt, maple syrup (and if not using Biscoff a pinch of cinnamon). 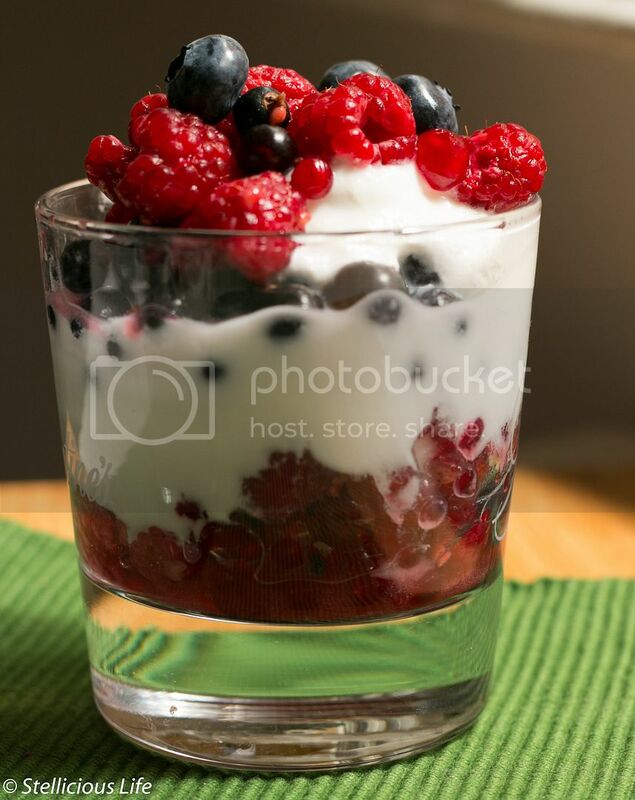 In a glass or jar start layering the Biscoff crumbs, then one layer red berries, spoon atop a layer of Greek yoghurt, another layer of Biscoff crumbs, then add a layer of blue berries, top with a few spoonfuls of Greek yoghurt and sprinkle with berries on top. 1. I used a mix of raspberries and red-currant & blueberries and black-currant, but it would be equally delicious with strawberries, pitted sweet or sour cherries, blackberries, you can mix it up any way you want.